Gain up to 19 hp and 27 lbs. x ft. torque and outflows the factory intake by 50%. Want a better deal? Contact us about a performance package today. This Stage 2 cold air intake system produced 11hp and 15lbs. x ft. torque and is designed to increase air flow and velocity for maximum performance and throttle response. 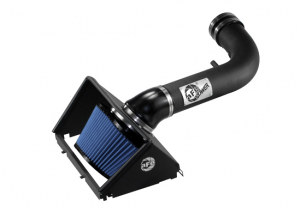 This intake includes a massive 360 degree Pro 5R air filter and utilizes the existing lower air box for easy installation, with a one-piece, snap in heat shield. This intake system also features a heat-insulating molded plastic tube that replaces the stock intake tract and directs increased airflow with improved volumetric efficiency for maximum performance.